Venus is a prime target for space missions and the first were sent by both the Soviets and the Americans at the start of the 60s: in fact, Venus is twice as close to Earth as Mars is and celestial mechanics calculations are easier for a planet without a moon. Since the dawn of the space age, a total of 23 missions (American and Soviet) have successfully travelled to Venus, out of 41 that were launched (counting all of those that flew past Venus without being dedicated to studying it). This success rate is much higher than that of Mars missions. In 1962, the American probe Mariner 2 flew past Venus for the first time at 35 000 km and took the first in-situ measurements of the temperature (then evaluated as > 200°C) and the high atmospheric pressure. It also discovered the slow retrograde rotation of Venus. During the following three years the Soviets sent lots of missions, including the first Venera probes but most were lost. However, in 1967 the descent module of Venera 4 retransmitted the first data on the lower levels of the atmosphere (between 55 and 25km) confirming its dominant CO2 composition and its density. After 2 further attempts, the Soviets finally landed Venera 7 on the surface in 1970, using a parachute. This was the first automated vehicle that man placed on another planet. For 23 minutes, it sent back exact data on the temperature (474°C) and pressure (90 bars, equivalent to the pressure 1000m below water on Earth!) The exploration of Venus seemed to be like that of the deepest ocean trenches, with heat and toxic gases added. In 1974 the American Mariner 10 probe took the first remote images in ultraviolet and studied the strange movements of the atmosphere, revealing the fast rotation of the same (super-rotation). One year later, the Soviets achieved another great accomplishment with black and white photos of the surface, sent by the lander of the probes Venera 9 and 10, huge machines that survived about 1 hour in the intense oven that is Venus. Galvanised, in 1978 NASA reacted with a complex and ambitious double mission: Pioneer Venus 1 & 2 combined an orbiter with several landers for the first complete study of the atmospheric strata (with sample analysis) and the surface. The data taken over several years demonstrated the major role of constituents like SO2 in the atmospheric chemistry of the atmosphere and the formation of clouds of sulphuric acid (H2SO4) in the upper atmosphere. This mission also completed the first radar survey of the planet which revealed a large number of volcanic formations (at the same time as observations from the Arecibo radio telescope showed more than 50 volcanoes of diameter > 50 km) and two higher mountain regions: Ishtar Terra and Aphrodite Terra. Over the next few years, the USSR did not sit idly by, they sent more and more satellites: in 1978 Venera 11 and 12 would also analyse the atmosphere and land in 2 regions of the southern hemisphere from which they would transmit data for almost 2 hours. However we would have to wait for Venera 13 et 14 in 1982 to have the first colour images of the surface of Venus, in the region of Phoebe. A drill also collected samples from beneath the landers that were analysed as basalt. The 80s were the golden age of Soviet Venus exploration, thus consoling the Russian scientists for their failures and disappointments in Martian exploration. Venera 15 & 16 in 1983 carried out radar mapping of the northern hemisphere. In 1985 Vega 1 & 2 en route to Halley’s Comet released two French balloon probes into the Venus atmosphere. These were designed by CNES to study the winds, along with two landers that were placed West of Aphrodite Terra and analysed soil samples. The last big mission to Venus dates back to 1989, with the launch of Magellan by the Shuttle Atlantis. The main instrument on Magellan was a radar that performed high resolution (120 to 220 m/pixel) mapping of 98% of the surface from 1990 to 1994. Magellan gave us very important results on the topography of the surface, tectonic activity and the apparently recent volcanism on Venus. The combination of data from Venera and Magellan satellites gives spectacular images of the Venusian volcanoes and certain unique geological formations. After this, space programmes focused on manned flight in low orbit, and on Mars, and Venus was almost forgotten. 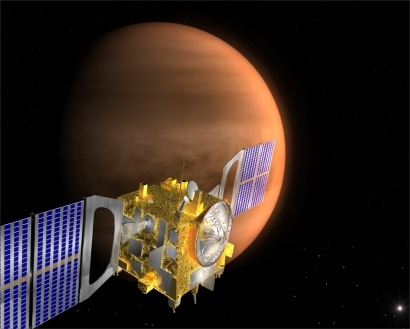 We would have to wait for 2005 to put Venus back in fashion with the launch of the European Mission Venus Express.